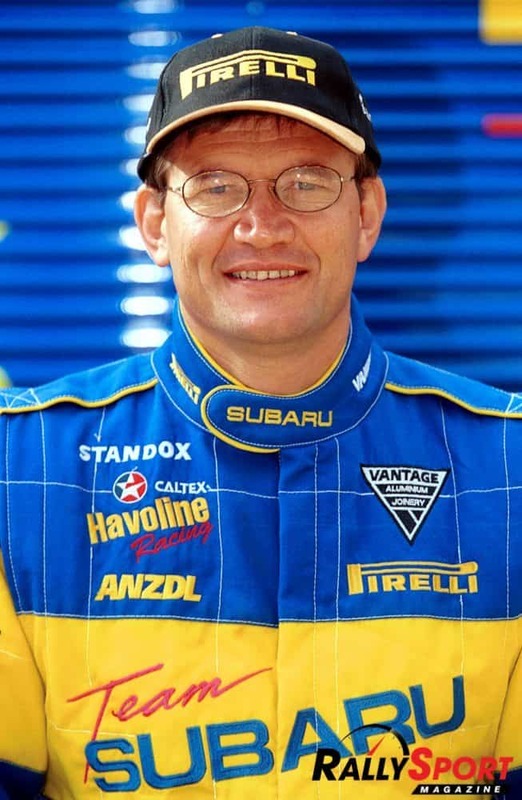 April 30, 2018 marks the 15th anniversary of Possum Bourne’s death, after the Australian, New Zealand, and Asia-Pacific Rally Champion’s horrific accident 12 days earlier. This is Part 4 in our tribute to Possum. Read more of our Possum Bourne tribute HERE. I have to admit that I never got to ride with Possum Bourne. A pity, really. I’m sure that the offer would have been there, but the opportunity never seemed to be just right. And having missed out on a ride with the Kiwi, one of life’s little pleasures has passed me by. I don’t know that I was particuarly keen to get into the spare seat in Possum’s rally car. Not the world’s best passenger, I never pressed the issue of riding with one of the greatest “natural” rally drivers that the two islands in the Tasman have ever seen. And it’s to my great regret that I can now never claim to have been privileged to watch him at work on a special stage from inside his car. And now Possum is gone. For ever. And he will never be replaced. Like many others, I was shocked when the news of his accident on the Race to the Sky course in New Zealand’s South Island filtered through. But Possum was always going to recover, we knew that. Tenacious, gutsy, a fighter who always kicked back when he was in a corner, Possum Bourne was renowned for turning a bad scenario into a good one. As we were to hear later on, one of his favourite one-liners was “You don’t realise how good the good times were until you experience a bad time.” This summed up Possum perfectly. But he didn’t get better, and he passed from this world on Wednesday, April 30, going to that great Special Stage in the sky. How he will be missed. It’s often said that we never realise just how well-respected we are until we’re gone, and this was never more true than in Possum’s case. Nearly 9000 email messages were sent to his website, thousands of people mourned his death on both sides of the Tasman, hundreds of thousands of words written about him by the media, visual tributes, floral tributes, and so it goes on. Tragic. In some ways, it’s strange that a Kiwi commanded such a following here in Australia. 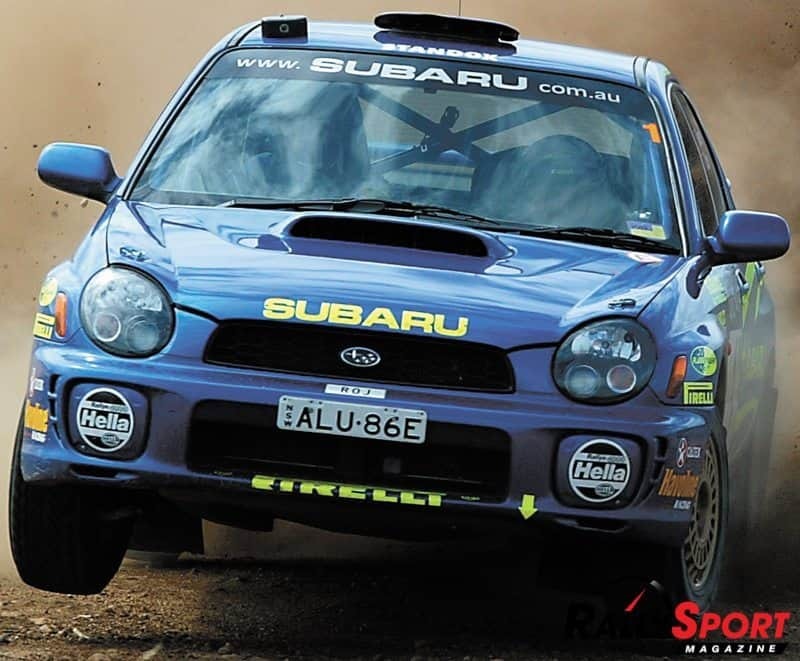 Always an interloper in the Australian rally scene, it wasn’t so long ago that we first welcomed him with open arms because he added some much-warranted competition to our domestic rally scene, and then we condemned him for consistently taking the major title away from us. The tall poppy syndrome was alive and well. Yet, despite all this (and I’m sure that not one of our current or past rally stars would disagree) he brought a breath of fresh air to our rallying scene that nobody before in the history of rallying in Australia had done. 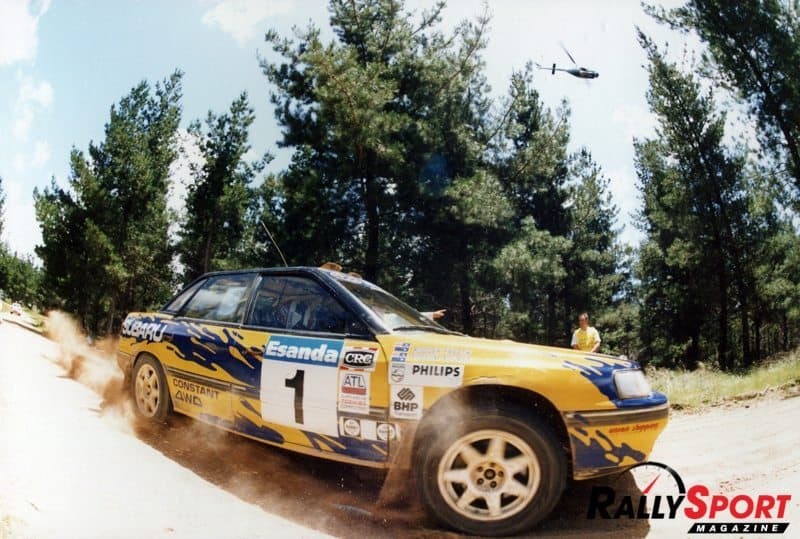 Stuart Bowes captured this brilliant shot of Possum Bourne at the Rally of Canberra in 1992. Peter “Possum” Bourne was a household name in Australia as well as in New Zealand. Not too many of our local Aussies can lay claim to that. He was apparently a lousy mechanic, a devoted husband and father, a great organiser, a terrific mate and an exceptional driver, a considerable amount of talent all rolled into one. Editor Peter Whitten wrote a piece in ARN recently about the “Possum” phenomenen which tried to explain the following that this laconic Kiwi generated. 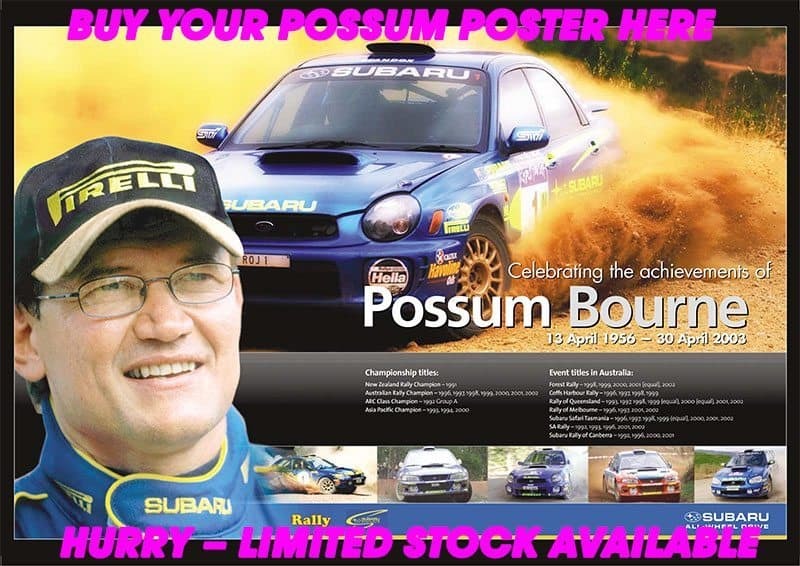 He remarked that particularly, but not only, in New Zealand, spectators on an event where Possum was entered, would wait until the familiar blue Subaru passed a spectator point and then move on en-mass to the next point to see him once again. He had that kind of following. There was only ever one Kiwi worth waiting around to watch. What will I remember about Peter Raymond George (Possum) Bourne? I’ll remember that swaggering, bandy-legged walk that typified him as he sauntered up to talk to you or to the TV cameras that seemed to be an integral part of the Possum publicity machine. I’ll remember that quizzical frown that so often crossed his forehead as he wrestled with a car problem or searched for an answer to a particularly curly question. I’ll remember the glasses he always wore and wonder how much difference they made to his driving ability. I’ll also remember that jet black moustache that he wore for as long as most of us can remember, before shaving it off to reveal a “new Possum” a couple of years ago. And I’ll remember the hordes of fans who would hang around for a glimpse, a word, an autograph or a handshake at his every outing. But more than anything else, I’ll remember that blue Subaru being flung through the bush within an inch of its life, almost always sideways, almost always flat out and being driven in a manner which few others anywhere, period, could do. Possum Bourne is gone, but the Possum Bourne legend lives on. He can never be replaced, but he will be fondly remembered for not only who he was, but for what he did for rallying in New Zealand and Australia. We all mourn his passing, none more so than his wife and family. Although he’s gone from our midst, let’s not mourn that he’s been tragically taken from us, but let’s give thanks that he has had such a huge impact on all our lives and done so much for rallying. Let’s also spare a thought for Mike Barltrop, the guy who collided with Possum, and who must now be going through hell as he recuperates from his injuries. Aren’t we all just that little bit better for having had Possum Bourne in our midst, even for such a relatively-short time? Isn’t rallying so much better because of Possum’s involvement? I’ll remember him for the things he contributed to rallying and the opportunities I’ve had of seeing him in action. But over and above these memories, always etched on my mind will be the memory of seeing him in action in the forest – totally committed, totally sideways and, I guess, totally Possum.